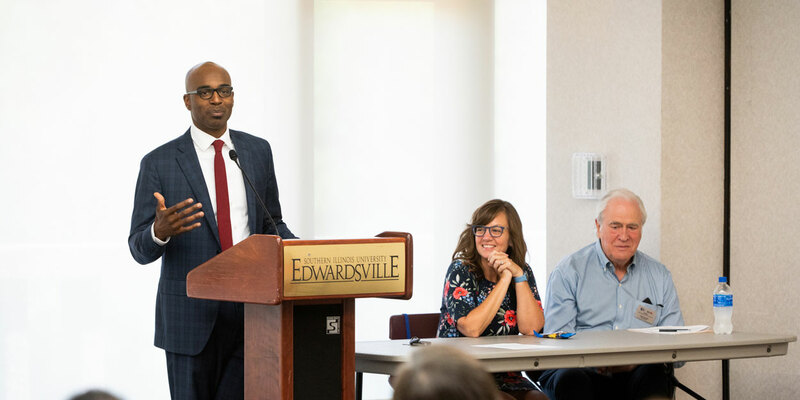 The SUAA/SIUE Chapter hosts two annual chapter meetings open to all SIUE employees, retirees, and surviving spouses: one in December which precedes the annual Chancellor’s Holiday Party; the other in June which precedes the annual Retirees Reception. These meetings typically include speakers discussing legislative issues affecting higher education, current employees, and your current or future retirement benefits, including health insurance updates. In addition to the annual chapter meetings, the board is committed to delivering informational meetings on topics such as how SURS employment impacts Social Security, planning for a secure financial future, TRAIL (the State managed Medicare health insurance package), and more. The board is always interested in suggested topics of interest to all current SIUE employees as well as SUAA members. Use the Contact Us form on this site to submit your recommendation(s). Meetings are announced on this web site, via email notices to current SUAA/SIUE members and through current employee and retirees listservs for the eToday.